There's still a chance that the U.S. could get back the money it invested in saving General Motors from collapse during the recent financial crisis, but was that $42.2 billion gamble worth the risk? At the time, the cash poured into GM saved the jobs of American workers -- hundreds of thousands at GM and millions when you take into account the suppliers and dealers. Still, the odds are that the taxpayers won't get all that money back. This week, GM filed for an IPO, which will give the government a chance to start selling off its stake. According to Bloomberg, to recoup its investment in the 61% of GM's common shares that it owns, the federal government would need those GM shares to be worth a total of $69 billion -- 38% more than their current implied equity value of $50 billion, based on the price of GM bonds. This is the same amount I estimated in a DailyFinance article back in June 2009, and 65% higher than Ford's (F) current market capitalization of $41 billion. So what would it take for GM to exceed Ford's value by 65%? First, GM would have to reverse a market-share slide that took it from 51% of the North American market in 1962 down to 19.2% in July 2010. Admittedly, GM is a global company and its success in China -- thanks to the popularity of its Buick Excelle there -- is more than offsetting the $160 million in losses it suffered in its European business, according to Bloomberg. Unfortunately for those hoping that GM might make tremendous gains in China, its success there is likely to attract competitors. Nevertheless, GM is better off than it was before it filed for bankruptcy in 2009. I analyzed GM's 2007 income statement and compared it to how GM did in the first half of 2010. The two most important improvements were a boost in GM's gross margins -- its sales minus its cost of goods sold -- and a plunge in its so-called "other expenses." 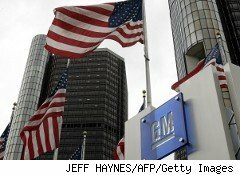 Specifically, GM's gross margin improved from 8% in 2007 to 13% in 2010 due to its trimming of unprofitable product lines and reduction in labor costs. GM's other expenses fell from 2% of net sales in 2007 to near 0% in 2010. Based on GM's likely market capitalization of $50 billion, America's shares in GM are worth $30.5 billion -- $11.7 billion less than the taxpayers invested. Nobody can predict whether those shares will rise enough in value to let the U.S. get back all the $42.2 billion it invested. And even if it did get back every penny, that still wouldn't compensate the government for the risk it took. The real question, though, is whether the U.S. jobs saved by that investment justify the likelihood that the country will only get part of its money back, and could end up taking a huge haircut. The answer to that is above my pay grade.